There are many factors for consideration when deciding which artificial grass to choose but the main ones are Yarn, Construction and the Backing. Artificial grass technology has moved on at a rapid pace and the yarns are thinner, softer and matte in finish, all of which go to make a fabulously-realistic grass. In addition to the yarn, the construction of the grass plays an important part in the durability of the grass. In terms of construction, 3 specifications should be borne in mind; the weight per square metre, pile height and the number of stitches per square metre. Finally, a quality backing is key in order to lock the tufts securely in place. The backing normally consists of a primary backing into which the fibres are tufted. A layer of latex (secondary backing) is then applied in order to secure the fibres in place. This secondary backing ensures that the fibres will not come loose and serves to keep the lawn’s appearance lush and green. 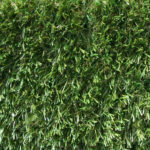 Here at Oakdale Fencing we supply a variety of different types of artificial grass. If you are looking for a cost effective long term turfing solution, then our range of artificial grass is the perfect option. All of our artificial grass products are made from high quality monofilament yarn. This material makes for both a very realistic feel and an aesthetically pleasing finish. 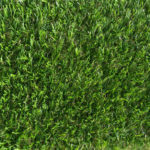 The benefits of high quality artificial grass have made it extremely popular amongst gardens and landscapers. All the styles of grass available to order from our website are fully UV resistant, ensuring that over time the colour of your lawn will not change. For those people who are pet owners, artificial grass doesn’t change colour when urinated on by dogs or cats. This ensures that your lawn looks pristine all year round. As well as looking extremely realistic, artificial grass is very easy to maintain. Unlike natural grass that takes years to grow or can be quickly ruined over a particularly hot and dry Summer, artificial grass looks great everyday of the year. The most obvious benefit of artificial grass is the non existent mowing. Unlike natural grass that needs a high level of maintenance including mowing, weeding, and seeding. Artificial grass is very easy to clean and requires very little maintenance once it has been laid. For many gardeners who suffer from allergies such as hay fever, artificial grass allows them to enjoy the benefits of a perfect garden lawn without having to worry about pollen. The ever increasing quality of artificial grass has resulted in both a lifelike look and feel. Both the yarn that resembles the blades of grass and the black latex and styrenebutadiene that forms the base layer come together to provide a realistic texture and bounce that feels just like walking on natural turf. Where to use Artificial Turf? Artificial Grass (also known as artificial turf) can be used almost anywhere. The new form of landscaping has become popular in both the domestic and commercial sectors. Artificial grass is great for areas that would otherwise need a lot of maintenance. Ideal for outside office blocks, pub gardens or even weeding venues. The high quality yarn helps provide a well maintained look all year round. The same benefits apply to home owners who want there lawns to look perfect throughout every season. 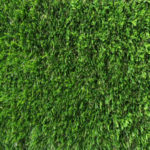 All the artificial grass available from Oakdale Fencing is 100% environmentally friendly and free of lead and cadmium. This means that it is perfect for both small children and pets. All of our artificial grass is easy to lay and comes in 4 metre wide strips. Simply measure the area you wish to lay the artificial grass on and order the required amount. Prior to laying the roles of artificial grass, you should ensure that the area has been sufficiently prepared. Suitable edging such as log border panels will need to be installed to ensure that the grass meets a well finished border. Depending on the existing condition of the area upon you wish to lay your grass, you made need to lay a base layer of evenly spread sand to create a level surface on which to lay your rolls of grass. We would also recommend the use of a landscaping fabric underneath your artificial grass to stop any unwanted weeds potentially growing up from underneath. For areas that are wider than 4 metres, joining tape with be needed to help provide a seamless finish between one strip of grass and the next. If you have any questions regarding artificial grass, or any of the products on this page, please feel free to give our team at Oakdale Fencing a call on 02476 588909.